I am going to my Fathers, and tho' with great difficulty I am got hither, yet now I do not repent me of all the trouble I have been at to arrive where I am. My sword, I give to him that shall succeed me in my pilgrimage, and my courage and skill to him that can get it. My marks and scars I carry with me, to be a witness for me, that I have fought his battles, who will now be my rewarder. They are for religion when in rags and contempt; but I am for him when he walks in his golden slippers, in the sunshine and with applause. A foul Fiend coming over the field to meet him; his name is Apollyon. The man that takes up religion for the world will throw away religion for the world. There can be but one will the master in our salvation, but that shall never be the will of man, but of God; therefore man must be saved by grace. Beware of resting in the word of the kingdom, without the spirit and power of the kingdom of that gospel, for the gospel coming in word only saves nobody, for the kingdom of God or the gospel, where it comes to salvation, is not in word but in power. I have formerly lived by hearsay and faith, but now I go where I shall live by sight, and shall be with Him in whose company I delight myself. The covetous man feareth not God. This also is plain from the word because it setteth covetousness and the fear of God in direct opposition. Men that fear God are said to hate covetousness, Exod. xviii. 21. Besides the covetous man is called an idolater and is said to have no part in the kingdom of Christ and of God, Col. iii. 5. And again; 'The wicked boasteth of his heart's desire and blesseth the covetous whom the Lord abhorreth,' Psa. x. 3. He that doth righteousness; that is, righteousness which the gospel calleth so, is righteous; that is, precedent to, or before he doth that righteousness. For he doth not say, he shall make his person righteous by acts of righteousness that he shall do; for then an evil tree may bear good fruit, yea, and make itself good by doing so; but he saith, He that doth righteousness is righteous; as he saith, He that doth righteousness is born of him. A great horror and darkness fell upon Christian. A comely sight indeed it is to see, a world of blossoms on an apple tree. There is no way to kill a man's righteousness but by his own consent. A man that could look no way but downwards, with a muckrake in his hand. 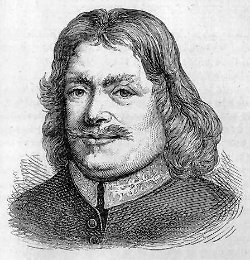 Bio: John Bunyan was an English writer and Baptist preacher best remembered as the author of the religious allegory The Pilgrim's Progress. In addition to The Pilgrim's Progress, Bunyan wrote nearly sixty titles, many of them expanded sermons.